Notes: Tebay Station was opened by the Lancaster & Carlisle Railway on 17th December 1846, the station became a junction on 8th August 1861 with the opening of the cross Pennine route from Darlington across Stainmore. At the junction there was a vast area of exchange sidings for coke, coal and iron ore wagons using the cross country line. To serve the Stainmore line a two bay locomotive shed was built at Tebay in 1861, this was quickly found to be inadequate and a new four bay shed was provided in 1866 closing again on 31st October 1902. The LNWR also had a shed at Tebay on the west side of the line to the south of the station. shed was rebuilt between 1948-50 and had a 50' turntable. Locomotives for banking heavy trains up Shap bank and for local trip freight were held at this shed. 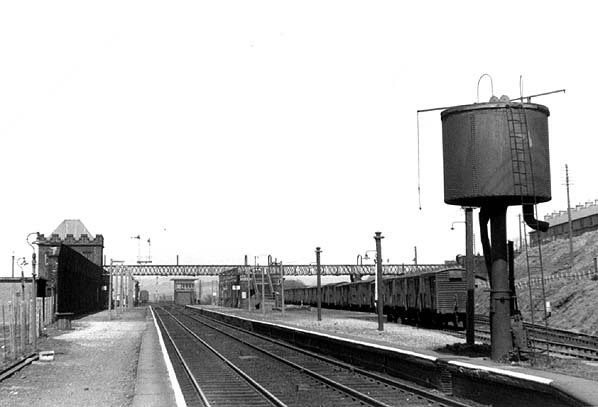 The station had three platform faces with goods facilities on the east side of the line including a goods shed and cattle dock and three signalboxes. Goods facilities were withdrawn from 2nd March 1964. From 1832 there were numerous proposals to build a branch line from Barnard Castle to the Stockton & Darlington Railway but these met stiff opposition from successive Dukes of Cleveland who owned most of the land around Barnard Castle. Eventually a Bill was approved in 1854 for a line from a junction with the S & D at Darlington to Barnard Castle. The line was built by the Darlington and Barnard Castle Railway opening on 9th July 1856 with intermediate stations at Broomielaw, Winston, Gainford and Piercebridge. In 1856 the South Durham & Lancashire Union Railway was formed with the object of building a freight line from Bishop Auckland to Barnard Castle and across the Stainmore summit in the Pennines to Tebay on the Lancaster & Carlisle Railway. This is a sparsely populated area and initially there were no proposals for a passenger service, the proposed line would carry iron ore from Barry in Lancashire to the blast furnaces of Teesdale while in the opposite direction coke and coal were carried to the iron ore mines which had flourished in the Furness district of Lancashire. The Act for the construction of this line which by now included a passenger service, encountered practically no opposition and the Royal Assent was granted on 13th July 1857 with work starting at Kirkby Stephen six weeks later. In the meantime, the Eden Valley Railway Company was formed in 1856 to build a line from a junction with the Lancashire Union at Kirkby Stephen to a junction with the Lancaster & Carlisle Railway at Clifton with intermediate stations at Musgrave, Warcop, Appleby, Kirkby Thore, Temple Sowerby & Cliburn. Construction started on 4th August 1858 and the line was opened for mineral traffic on 8th April 1862 and to passengers on June 1862. A further intermediate station was added at Clifton on 1st August 1863 and a junction with the Midland Railway's Settle - Carlisle line was provided 500 yards north of Appleby Station. The two stations at Barnard Castle were some distance apart necessitating a long walk. 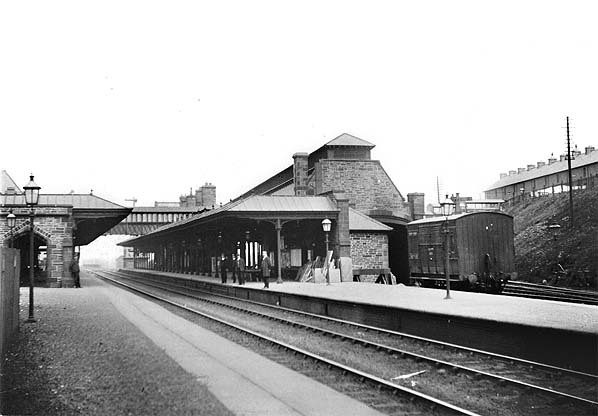 To alleviate this, trains from Darlington were diverted into the Lancashire Union station on 1st May 1862 and on the same day the original terminus was closed to passengers but remained open for freight until 5th April 1965. Both the Lancashire Union and the Eden Valley lines were worked by the Stockton & Darlington Railway from the outset and that company took them over on 30th June 1862, only to be swallowed by the North Eastern Railway on 13th July 1863. The timetable for September 1961 showed only two trains in each direction between Darlington and Tebay and the line always struggled to attract many passengers beyond Barnard Castle; at the turn of the century before motor busses reached the area several of the smaller stations were unable to run at a profit. Apart from the regular passenger service a number of excursions used the line including summer Saturdays only trains between the north-east coast and Blackpool and an unusual service which lasted until the lines closure was an unpublicised passenger train once every two weeks, normally on a Friday. This was The National Union of Mineworkers train from Durham to Ulverstone carrying injured and sick miners to their convalescent home at Conishead Priory. Its normal route was Durham, Bishop Auckland, Barnard Castle, Kirkby Stephen and Tebay. When opened, the lines from Barnard Castle to Tebay and Kirkby Stephen to Penrith were both single, but sufficient land was purchased to enable a double line to be constructed if required and on the Lancashire Union all but three of the viaducts were built to take double track. With the growth of freight traffic much of this line was doubled in stages between 1867 - 1874 and on the Eden Valley the sections between Appleby Station and Appleby Junction, and Clifton Moor to Eden Valley Junction were doubled. The three viaducts were eventually rebuilt. Locomotive sheds were opened at Kirkby Stephen and Tebay in 1861 (Tebay closed 1902), each holding two engines. That at Kirkby Stephen was enlarged 1865 and again in 1867 (Closed 1961). A further shed at Barnard Castle shed was authorised in 1864, and extended in 1875 (closed 1937). By 1910 the service had improved with seven trains in each direction on weekdays between Darlington and Barnard Castle, three of these running through to Tebay and Penrith; forty years later, under BR, the service was virtually the same. For many years the 196 foot high Belah Viaduct had a stringent weight restriction imposed on it, this led to most of the heavier trains being double headed by smaller locomotives and in BR days West Auckland shed had Standard Class 3 2-6-0’s specially allocated for Stainmore freights and excursion passenger trains. After WW2 a programme of passenger closures began. The first section of the line to go was between Kirkby Stephen East and Tebay which lost its passenger service from 1st December 1952. 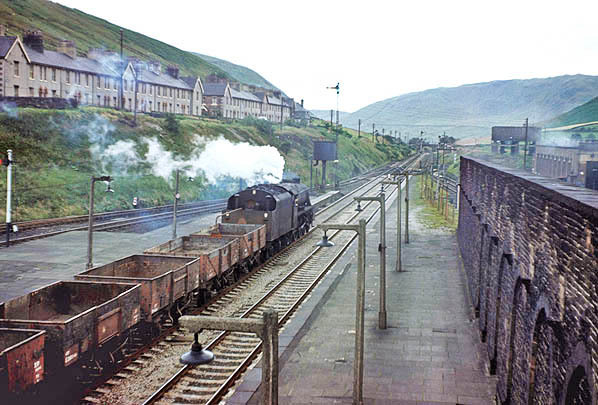 From that date Smardale and Gaisgill stations were closed completely, but Ravenstonedale remained open for freight. On the Eden Valley line, Musgrave was closed completely on 3rd November 1952 and Kirkby Thore on 7th December 1953. Temple Sowerby was closed to passengers on the same day but remained open for freight while Cliburn was closed completely on 17th September 1956. 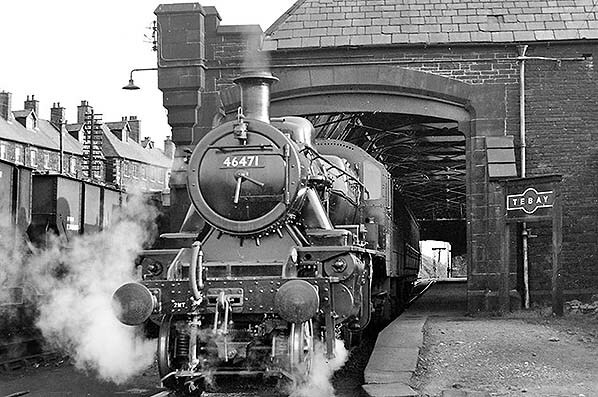 Between Barnard Castle and Kirkby Stephen East, Barras was converted to an unstaffed halt (and closed to freight) from 1st December 1952, and Lartington similarly from 2nd February 1953. Despite these closures the line was still a popular summer excursion route between the north east and Blackpool and there was still considerable east-west freight traffic although the industries served were now in decline. Through the 1950’s the coal and coke trains from the North East often had as many as 30 wagons hauled by three locos; a double-header and a banker. Diesel multiple units were introduced between Darlington and Penrith on 3rd February 1958 and with the increased speed now possible over the Stainmore summit there were suggestions that the service should be improved with through trains running from the North East to Keswick but the following year rumours began to circulate about a withdrawal of the passenger service between Barnard Castle and Penrith after services were cut. On the 9th of December 1959 passenger numbers were described as "disappointing" despite an increase in passenger revenue and total closure was announced of the line between Tees Valley junction (one mile west of Barnard Castle) and Merrygill (one mile east of Kirkby Stephen East) and from Appleby East to Clifton Moor. 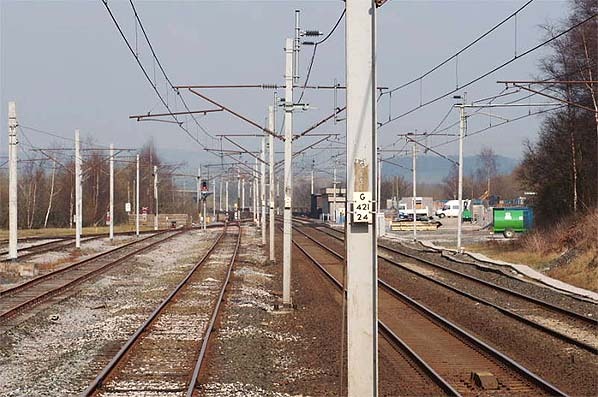 The remaining section of the line was to be retained for freight traffic From Merrygill to Appleby East and between Eden Valley Junction to Clifton Moor. The line east of Kirkby Stephen East and Tebay would also remain open as far as Hartley Quarry. This proposal included the withdrawal of passenger services from the remaining stations at Lartington, Bowes, Barras, Kirkby Stephen East, Warcop, Appleby East, and Clifton Moor, and the closure of the goods depots at Bowes, Ravenstonedale and Temple Sowerby. Restricted goods facilities would still be provided at Kirkby Stephen East, Warcop, Appleby East and Clifton Moor would become an unstaffed goods depot. There was a spirited campaign and petition to keep the lines open but following prolonged deliberation approval for the closures was given by the Minister of Transport on 7th December 1961. The North Eastern and London Midland Regions of British Railways moved quickly, and only twelve days later they announced that the last trains would run on January 20, 1962. Normally the last passenger train would have been the 8.30 p.m. diesel from Penrith to Darlington, but the Railway Correspondence & Travel Society had arranged for a special steam-hauled train, conveying enthusiasts and others on that day and this was actually the last train conveying passengers to run between Penrith, Kirkby Stephen and Barnard Castle. The train started at Darlington and ran through to Tebay with photo stops at Kirkby Stephen East and Ravenstonedale, it then returned to Kirkby Stephen East before continuing to Carlisle. It returned after the last passenger train from Penrith arriving back at Darlington around midnight. The line between Tebay to Hartley Quarry remained open until the end of 1963 after which date the quarry could still be reached via the junction with the Settle – Carlisle line at Appleby , this line also continued to serve Brough Quarry the army ranges at Warcop. Track lifting across the Stainmore summit began almost immediately. 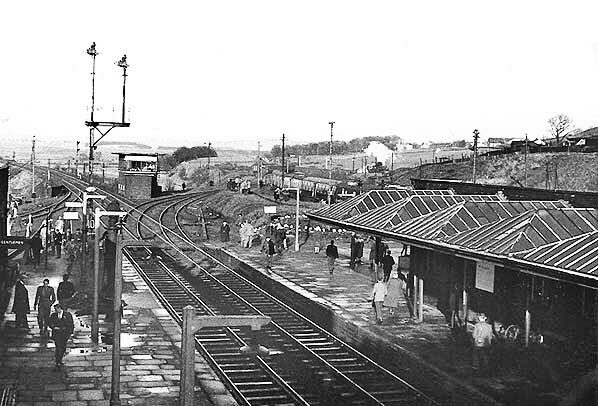 Although the line between Darlington and Barnard Castle remained open as part of the branch to Middleton in Teesdale it was only a temporary reprieve as this too was quickly proposed for closure under the Beeching cuts closing to passengers on 30th November 1964 and to goods on 5th April 1965; the track was lifted shortly after closure. The line from Appelby to Hartley Quarry remained in use until October 1974 and it was then cut back to Warcop. The six miles of track between Abbleby and Warcop remained in use until 6th March 1989 and today the track still remains in place. The Eden Valley Railway Society was formed in 1995 with the aim of reopening this remaining section of line and the first passenger trains started running north from Warcop in 2006. In 1996 Kirkby Stephen East Station was acquired by the Stainmore Railway Company which is working to develop the site as a Heritage Centre and working railway representing the early 1950’s. The eventual aim of both societies is to reinstate a passenger service between Kirkby Stephen East and Appleby East. Today much of the route over Stainmore is intact although the viaducts at Belah, Deepdale and Tees have been demolished. Near Kirkby Stephen the Merrygill and Podgill Viaducts were restored by the The Northern Viaduct Trust in the 1990's forming part of a circular walk which follows the trackbed between Kirkby Stephen East and Hartley Quarry. Sources: Railway Magazine - April 1962 'Over Stainmore Summit' by K. Hoole. Railway Magazine - August 1989 'Stainmore the echoing silence' by Peter Hill. Cumbria Railways web site and Roy Lambeth. Tickets from Michael Stewart. To See other stations on the Darlington - Tebay line click on the station name: Darlington North Road, Piercebridge, Gainford, Winston, Broomielaw, Barnard Castle (1st), Barnard Castle (2nd), Lartington, Hulands, Bowes, Barras, Kirkby Stephen East, Smardale, Ravenstonedale, Gaisgill & Tebay. For the Eden Valley Line see Musgrave, Warcop, Appleby East, Kirkby Thore, Temple Sowerby, Cliburn & Clifton Moor. See also Clifton & Lowther. decades of life left in them.